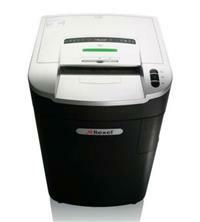 The Rexel Mercury RLS32 Strip-Cut Shredder is suitable for large offices with over 20 users. It offers a P-2 security rating for shredding everyday documents (rather than confidential material). The shredder will take up to 34 sheets of 70gsm paper (or 32 sheets of 80gsm) and shreds into strips 5.8mm wide. The large 115 litre bin will take up to 1250 shredded sheets and is easy to empty thanks to the shredder’s pull-out frame. There is a display indicator to alert the user when it needs emptying and recyclable bags can also be used with the unit. Rexel recyclable paper waste sacks (product code 2102248) or Rexel plastic waste sacks AS1000 (product code 40070) are both compatible with the RLS32. Other features include a power saving mode that automatically activates after 2 minutes non-usage, easy to use controls and a fast shredding speed. The shredder also comes with Mercury Anti-Jam Technology, which uses sensors to judge the thickness of paper being fed into the machine – if it is too thick then a light will come on prompting you to remove some. The RLS32 has a separate CD tray to collect shredded CD shards, great if you want to keep different types of shredded material separate for the purposes of recycling. An auto-oiling mechanism is also a feature of this unit – the shredder will automatically lubricate the cutters after a period of operation, keeping the shredder working optimally. You just need to periodically refill the oil, Rexel product code 1760049.